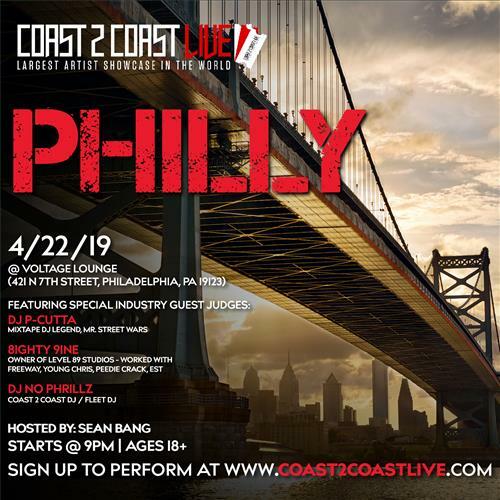 Next time I'm in center city, I'm definitely making another trip to Voltage! April 19, 2019 Vortex: featuring The Mysterious Easter Egg Hunt! **FEATURING THE MYSTERIOUS EASTER EGG HUNT! ** HAPPY BARF DAY CHRISTOPHER YOUNG! SYNTHWAVE //// SOME EASTER GOTH MAYBE? //// ALTERNATIVE CLASSICS & MORE! GO GO DANCERS: YOU! SHAKE YOUR LITTLE FLUFFY TAIL ON OUR STAGE! Classic Hip-Hop Night pays tribute to the golden era of rap. On this night DJ Selecta from Pittsburgh, PA will rock the wheels of steel with hip-hop tracks from 1979 to 1999. The panel of judges will rate each performance and choose the top 3 artists to win our prizes. About: We started The Showcase Tour in 2016 with the desire to give every artist a platform to showcase their music…to a live audience…in any city. Our first tour had only 5 shows on the schedule. Today, we host over 150 shows per year in 4 different countries, to find the best-untapped talent. The Finale is on Aug 31 & Sept 1, 2019, in Los Angeles, California at Catch One. One lucky & very talented artist will walk away with $50,000 in their bank account and a U.S. tour on their schedule. ★ ALL THAT 90s PARTY with DJ Marco breaking down the 90s and reconstructing the decade at Voltage Lounge. Rap, R&B, New Jack Swing, House, Grunge, Alternative, Electronic and Pop music. $10 Advance, $15 Day of party. aka The Genius, is a founding member of Wu-Tang Clan, GZA is the group’s “spiritual head”, being both the oldest and the first within the group to receive a record deal. Liquid Swords, produced and recorded entirely in the basement studio by RZA, with the participation of all original Clan members. It was released on November 7 by Geffen Records. The album’s complex composition included dialogue sampled from kung fu film Shogun Assassin. The album was met with positive reviews and sold well. It is considered to be one of the best albums from the Wu-Tang camp. It peaked at the #9 spot on the Billboard 200 chart and #2 on the Top R&B/Hip Hop Albums chart. On October 8, 2015, the Recording Industry Association of America announced that the album had earned a Platinum certification for having sold more than 1 million copies. It became the first Wu-Tang-related album to get certified since 2004, when Method Man and Ghostface Killah both earned plaques. In addition, he directed music videos for four album singles. PAHC’s prettiest dude started a new band w/ members of Mushmouth, Out To Win, etc. First show! Wear Your Wounds is a solo project of Converge’s frontman Jacob Bannon. SPINNING: Drake • My Chemical Romance • Post Malone • Panic At The Disco • Cardi B • Fall Out Boy • Lil Uzi Vert • Taking Back Sunday • Future • Paramore • MIGOS • New Found Glory • Young Jeezy • Good Charlotte • Gucci Mane • Jimmy Eat World • 2 Chainz • The Used • Kayne West • Saves The Day • Lil Peep • Bowling For Soup • 21 Savage • Simple Plan • G-Eazy • Mayday Parade • Nicki Minaj • Blink 182 • Fetty Wap • The Wonder Years • 3oh3! • Travis Scott • The Killers + more. an American Celtic punk band from Chicago, Illinois, that formed in 2000. The group’s use of Scottish Highland bagpipes has led to their classification as a Celtic punk band, comparable to Dropkick Murphys or Flogging Molly. Chances are, if you are anywhere near the Detroit music scene, you’ve heard of the influential hip hop trio that makes up Slum Village. The group was founded in the early 90′s by 3 childhood friends: Baatin, T3, rapper and producer J Dilla, who all grew up together in the Conant Gardens neighborhood of Detroit. In 1991 the group changed their name to Slum Village recording their first album “Vol. 1″, in Dilla’s basement and RJ Rice Studios, it was critically acclaimed in the Detroit underground scene, later finding its way into the hands of A Tribe Called Quest’s own Q-Tip, who played it for some of hip hop’s elite, such as Busta Rhymes, Questlove, and D’angelo. June 5, 2019 Falsifier, VCTMS, 156 Silence, & more! The Technicolors are an American rock band from Phoenix, Arizona formed in 2010. The band’s line-up includes founder Brennan Smiley (lead vocals, guitar), Sean Silverman (guitar, keys, backing vocals), Nico (bass guitar), and Austin Scates (drums, percussion). They are best known for their nuanced approach of combining lo-fi, cerebral groove-oriented elements with anthemic, often bombastic themes reminiscent of the early 00’s garage revival. $16 adv. / $20 dos.